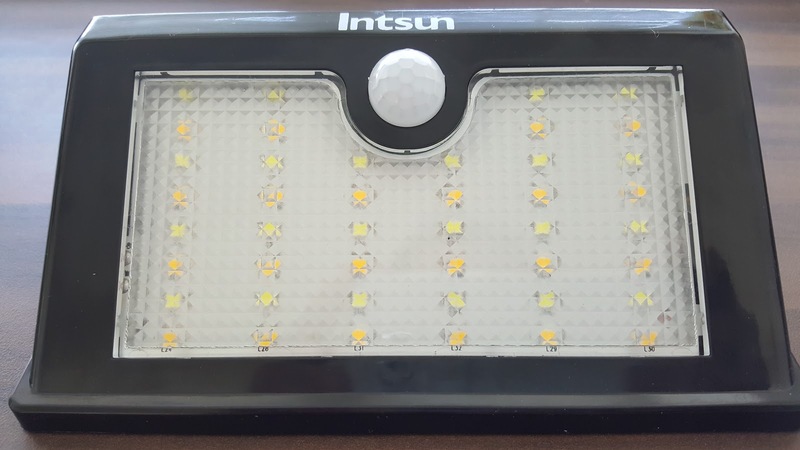 Important Note: The light only uses 22 LEDs at a time - 22 day white and 22 warm white, you can set the colour you want. 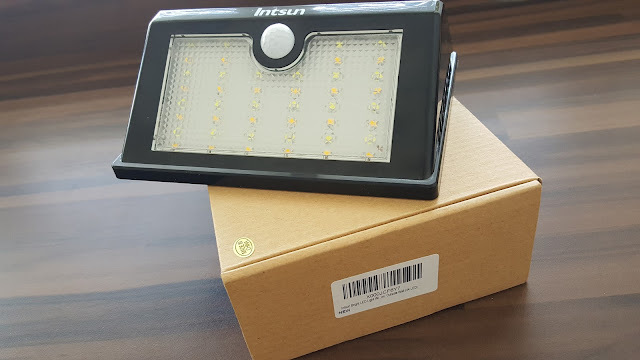 Thought to try out Intsun LED lights as the specifications were very interesting. Comes in a recyclable brown box, the Solar LED light itself, wall plug and screws, a chain to hang (not a fan of those, sorry) and manual. 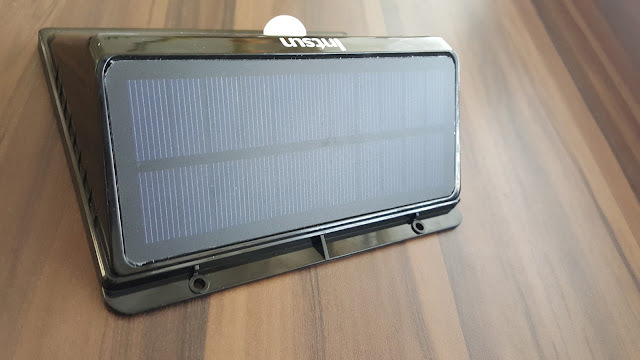 Straight out the box the unit appears to be very nice with matt finish solar panel and gloss black casing, where the solar panel is directly facing towards the Sun when mounted on wall. Angled design helps to focus the light in our own premises and not into neighbours property, diffuser makes the light scattered yet very bright. The settings on light are easily accessible and very helpful. When you are in outdoors and need bright light, just switch to full bright light mode and it will stay forever or until the battery dies. 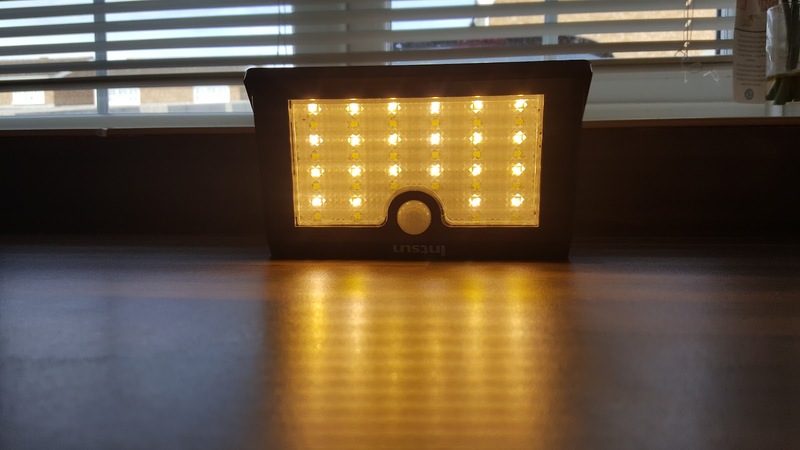 In my opinion the best setting would be dim continuous light and switch to bright light when the light unit sees a motion. Tested out the lights for few days including couple of cloudy days, surprisingly it worked through out the night in dim-bright setting. 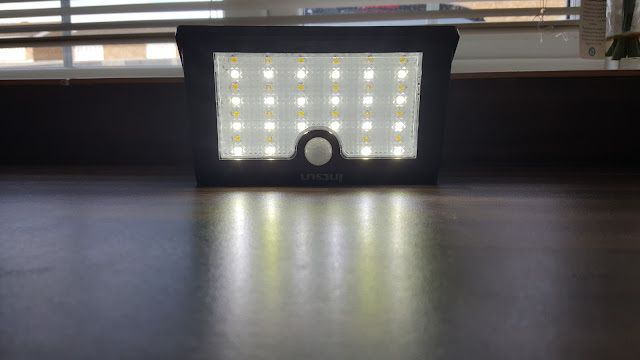 Brightness (assuming 400lm or around) is enough to light up the a small garden in full brightness setting. 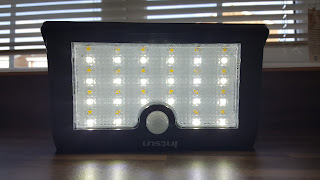 I'm sure built in 3.7V 2200 mAh battery is the real power horse behind these bright light, they are rated as IP65. Please check out the pictures to see how it looks in real life situation. Overall this is a very good option to consider if you are in the market for a solar security light.